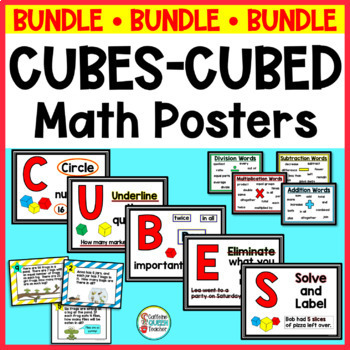 This is a BUNDLED set of CUBES or CUBED math word problem strategy posters and differentiated EDITABLE task card set for multiplication and division learners. Give students a story problem strategy using either CUBES or CUBED. This is a Bundled kit to save you money! 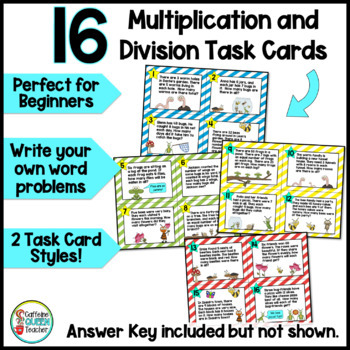 It includes the CUBES or CUBED Strategy Poster Kit and also includes a set of differentiated beginner level Multiplication and Division Word Problem Task Cards. 4 different styled versions of the story problem strategy posters – use the one that best suits your learners. 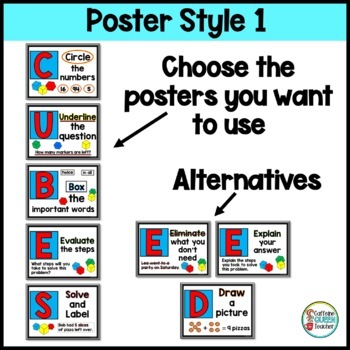 Three versions offer full-sized 8 ½” x 11” posters, while the other is a bit smaller, 4 ¼" by 11" posters for smaller classrooms. 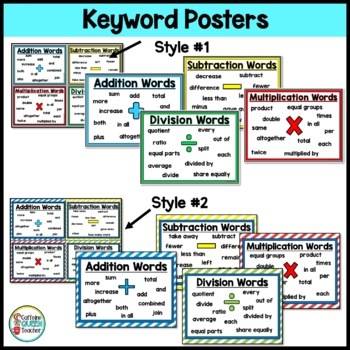 Key word posters for addition, subtraction, multiplication, and division. These posters come in handy while teaching students how to determine the correct operation. Small student-sized pocket posters are included for the students to receive their own copy. They can be laminated or taped onto folders so that they last for the duration of the year. → Cards 1 - 4 contains the basic information needed to solve the story problem. They are straightforward with no extra information that the student must eliminate before solving. → Cards 5 - 8 are a bit more “wordy” and contains some extra-unnecessary information. → Cards 9 - 16 become a bit harder yet, and contain information not needed to solve the problems. There are 16 one-step word problem task cards included. PowerPoint is needed to edit these task cards. Images on the task cards are not editable. Assign these word problem task cards at just the right level for your students as exit tickets, for Interactive notebooks, or allow them to experience all of the levels in a game of Scoot! Missing Factors! Task Cards and Mini-Quizzes!